The handle of the face brushes is flat on the bottom, so they can be stored standing upright. However, they don't store well in my brush holders because the handles are too thick. Also, if you're a long-time follower of my blog, then you know that I prefer my brushes to have a black matte handle and a nickel ferrule. They just look so much more professional and classy. However, I can get past the unconventional funky design of the Real Techniques brushes because they work so darn well. Bottom Line: Even if you have over 200 brushes in your collection, I still recommend checking out the Real Techniques collection because they're different from other synthetic brushes. They are flexible without being flimsy and glide product onto the skin effortlessly without ever tugging the skin or leaving a cakey finish. Also, the bristles feel as soft as a bunny's bottom and they do not shed! 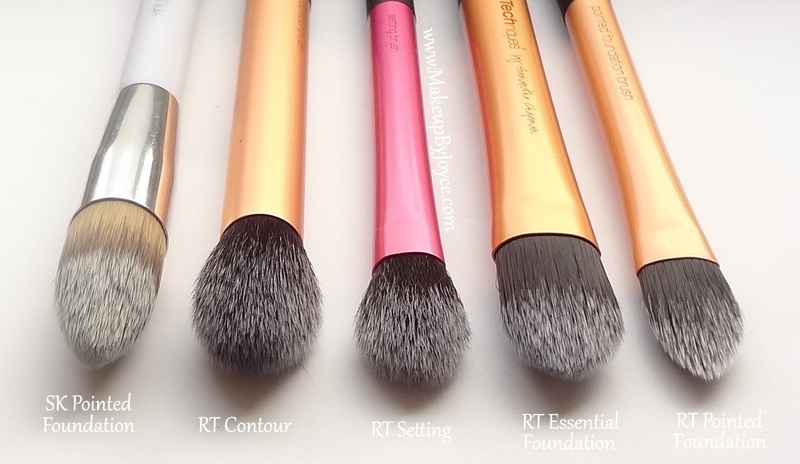 Note: The Real Techniques brushes can be purchased individually ($6-10) and they also come in sets ($18) at Target, Ulta and Drugstore.com. Which Real Techniques brush have you tried? None of the products mentioned are sponsored. Great thorough review. I had no idea synthetic material doesn't pack on powder as well. Good to know. Thank! Yea, natural bristles pick up n packs on powder product much easier. I prefer to use natural brushes to apply sheer powder products n mineral foundation, especially if I want more coverage, n synthetic brushes to apply highly pigmented powder products n liquid foundation. thank you for all the detail and lovely photos, the review is a bonus for me. Done downloading all of the pictures. (^_^) , now I have the core collection and travel essential set, but unfortunately I can't get the stippling brush because online shop here where I bought the brush sets didn't sell stippling brush, maybe someday I can have that one. Hi there. I see these are more face brushes. What is your favorite brand for eye brushes? And which brand of natural brushes do you prefer? I know this is an old post but just had to comment. This is the most detailed, well-written review of RT brushes I've ever read...and I've read many :) I'm just starting my RT brush collection and am bookmarking this page for reference. Thank you!